CKD (Českomoravská Kolben-Daněk) was the company already behind the first mass-produced Czech tank, the vz. 33 tankette. However, it only achieved limited production due to several design flaws, notably the lack of a traversing turret, while visibility, steering, suspensions and even armament were all problematic and led to the cancellation of further orders. CKD’s chief engineer designed a bigger vehicle, fitted with a fully traversing turret and a brand new suspension. Despite some good characteristics, the AH-IV was never ordered by the Czech army, but found its marks on the export market. Four pilot prototypes were built in 1937, and 153 orders were passed by Iran, Romania, Sweden, and Ethiopia. Despite a limited armament, this light tank was highly reliable, and their career far outlived the age of their original design. Iranian and Ethiopian models were still in service at the end of the XXth century. Like the former vz.33, the hull of the AH IV was made of framework of steel “angle iron” beams, upon which armored plates (6 to 12 mm/0.24-0.47 in thick), were riveted. The driver (on the left) had good visibility through an armored shutter and bullet-proof glass. To his immediate right was placed, in a fixed position, a light Zbrojovka Brno ZB vz. 26 or vz. 30 machine-gun, fired using a Bowden cable. The offset turret was placed on the right hand side, the gunner standing behind a vz. 35/37 7.92 mm (0.31 in) machine-gun well protected by an armored mantlet and fitted in a ball mount. The turret itself was limited in size, and the vz. 35/37 was shorter in order to serve in tanks. Normal provision was 3700 rounds. The engine was a six-cylinder, water-cooled Praga totaling 3.4 liters (211.6 cu in), producing 55 bhp (41 kW) at 2500 rpm, for a 14 bhp/ton ratio. Max speed was 45 km/h (28 mph) on flat terrain and road, which was far better than the former tankette, as was the operational range. However, this engine, which sat on the rear part of the fighting compartment, was not compartmented, and the cooling system used the commander and driver hatches for draft, which would cause many problems during their active life. The engine was served by a semi-automatic Praga-Wilson transmission and a 4-forward/1-reverse speed gearbox. The suspension and drivetrain were brand new and the most successful feature of this model, with four large wheels sprung by leaf springs. There was just one return roller at the middle, and the drive sprocket and idler wheel were placed at the extremes. The tracks were composed of moderately small soft metal links, with a total ground pressure of only 0.5 kg/cm2. It was capable to cross a 1.5 m (4.92 ft) wide ditch, climb a 50-60 cm (1.64-1.96 in) high obstacle or ford a stream 80 cm (2.62 ft) deep. The Iranian empire choose the lightweight Czech model as soon as it was available, placing an initial order for 50. They were built and shipped in 1936-37 and the armament was shipped separately and mounted by the end of 1937. After the first two years of use, the army was so pleased that two more orders were placed, of 100 and 300 machines, to be delivered from the end of 1939 to 1941. However, the war stopped this process. They were the lightest of all sub-versions, equipped with the vz. 26 and 36 machine guns. Their only military actions came with the Anglo-Russian invasion of Persia in August-September 1941. These tanks, part of the 1st and 2nd Infantry Divisions, were posted near Ahwaz, waiting for the British invasion. They never shot a fire in anger. On 14 August 1936, the Romanians signed a contract for 36 machines, slightly modified for their own use. CKD was given the task of delivering all of them through strict deadlines, in seven months after the prototype was delivered. However, so many changes were given during the production that these deadlines were respected only for the first batch of ten. They were thoroughly tested during the October 1937 maneuvers and were returned to the factory for further modifications. At the end, the delivery process and late acceptation meant that these AH-IV-R were accepted in service only in September 1938. The Malaxa company of Bucharest acquired a license, but only produced one tank of its own. These slightly heavier models fought during the general Axis offensive in Russia (Barbarossa), as part of the southern sector offensive. Actions included some hard-fighting at Stalingrad (autumn to winter 1942), and some were still used in 1945. 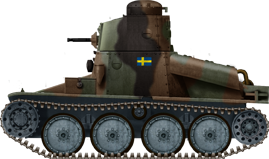 After successful trials in winter, on rough terrain, at home, Sweden ordered 48 Strv M/37 (the local designation) in 1937, to be built locally, at the Oskarshamn Factory. Main differences included a more powerful Volvo FC-CKD, developing 85 bhp, and thicker armor, up to 15 mm (0.59 in), cast by Avesta. The hull was much taller and larger (3.4×1.85×1.96 m/11.15×6.06×6.43 ft) and the total weight rose to 4.68 tons (5.16 short tons). The driver fixed machine-gun was eliminated, and the turret model was replaced by a twin Swedish Ksp m/36 Strv (fed with 3960 rounds). The turret itself was raised by an additional observation cupola. Max speed was now 60 km/h (37 mph) and range 200 km (124 mi). These were one of the fastest and most agile tanks in the world when finally put in service in 1938-1939. They were still in service in 1953. The Ethiopian versions were in fact purchased postwar, in June 1948, and duly modernized. Entirely welded, they sported a recent Tatra 114 diesel engine (65 bhp/2200 rpm), with an increased range of 200 km (124 mi), and 42 km/h (26 mph) top speed. Dimensions and armament were barely changed. The order was honored and they were shipped to Djibouti, and then carried by rail in May 1950 to Addis Ababa. They were the most active of all, with a career spanning nearly half a century, and many engagements such as the Eritrean War of Independence, Ethiopian Civil War, Ogaden War, and eventually the 1982 Ethiopian–Somali Border War. Iranian tankette CKD AH-IV, 1st Infantry Division, August 1941. The bigger TNH and this model were the main AVFs in Iranian service during WWII. 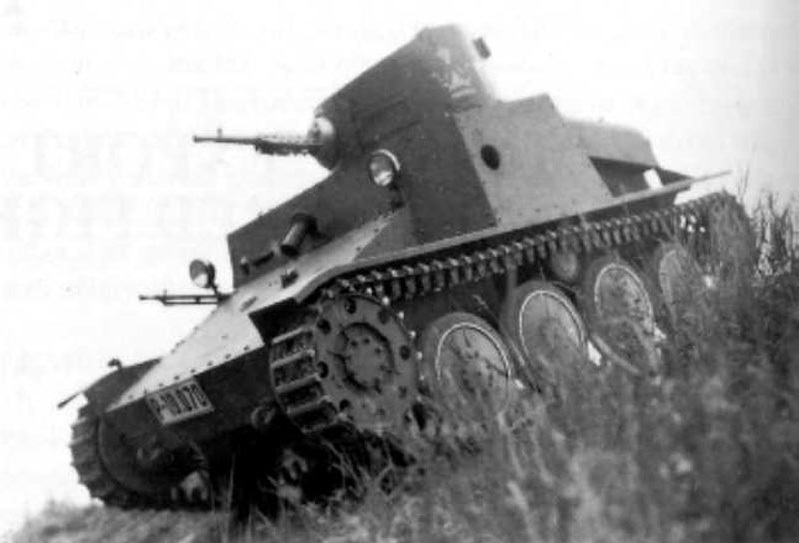 Romanian tankette CKD Ro-1, 6th Cavalry Brigade, Stalingrad sector, September 1942. All 35 vehicles were placed in six mechanized reconnaissance squadrons belonging to the cavalry brigades. They fought in Ukraine and the Caucasus, until their retirement after the defeat of Stalingrad. Swedish Stridsvagn M/37. This is a wartime pattern. Peacetime time pattern was brownish-khaki, with unit white stripes over the turret.